Food is important to every PCT thru-hiker. It’s also the thing I spend the most money on out here. PCT hikers always seem to be REALLY hungry, especially on town days. Food is the fuel that keeps the body going out here on the trail. When you hike 20+ miles a day, your body burns a lot of calories and is in constant need of refueling. On the PCT, if I’m not thinking about my next water source, I’m thinking about my next meal. Recently, I’ve had a few questions from followers out there asking me what I eat on trail. Even my friends and family are curious. Nutritionists and healthy foodies, close your eyes now. What you’re about to read isn’t pretty, but at least it’s honest. It’s true. We can pretty much eat whatever we want out here (and we do!) because we burn off everything we eat within a day’s worth of hiking. I don’t count calories or follow any sort of dietary guideline. I simply eat whatever my body craves. I am limited to the food options available along the trail, usually in the small towns I pass through. I could always send myself a resupply box from a bigger town, but I’ve found resupply boxes to be a bigger, more expensive hassle than they’re worth. Instead, I choose to resupply on trail. I think it’s worth mentioning, I don’t have any dietary restrictions or food allergies, but I can be a picky eater. If I eat too much of something, I get sick of it and never want to eat it again. Im looking at you Mountain House Breakfast Skillet, Rice Krispies Treats, PopTarts, energy/granola bars and instant mashed potatoes with brown gravy packets. What I eat on trail and off trail is very different. On trail, my meals consist of various flavors of Top Ramen, salami and hard cheese, croissants, apple turnovers, bread rolls, gummy bears, Oreos, cookies, beef jerky, chocolate covered almonds, mini Snickers, Gardettos snack cracker mix, Goldfish crackers and the occasional dehydrated meal. Mountain House Lasagna and Chili Mac, I’m definitely looking at you! In town, I eat anything that doesn’t require hot water to cook it. Some of my favorite in-town meals and snacks have included chicken strips and fries, turkey deli sandwiches, cheeseburgers, hot dogs, chicken pot pie, steak, pasta, a traditional breakfast with eggs, bacon and French toast, pizza, various salads loaded with veggies, watermelon and chips and salsa. I typically polish off any of these food items with a milkshake or several ice cold root beers, whenever they’re available. When it comes to eating on trail, more calories means more hiking. Some people blame “hiker hunger” on their ravenous feasts in-town or endless snacking on trail. I haven’t really had that issue. I just get really strong cravings. It might be three days until a town day and all I can think about is a veggie pizza or a peanut butter milkshake. It will be all I think about and talk about for days, yet once I make it into town, I don’t notice myself eating any more food than usual. I’ve yet to run out of food out on trail, but I can always tell when I haven’t had enough to eat. I feel tired, cranky and sluggish. Sometimes I have to force myself to eat, even when I don’t feel like it because I know I have to keep my energy up. As long as I have food in my food bag, I eat it. The good thing is, the more I eat, the less I have to carry. 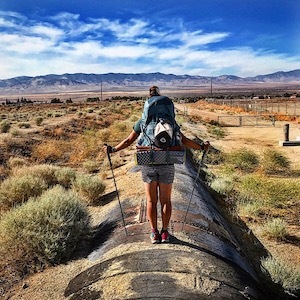 Be an active part of my PCT hike without having to take a single step! Click Here to sponsor a shower, load of laundry, meal or a whole town stop. You know how many times I’ve craved an 8oz Burger out here? Countless!! What I would give for a Fondue Burger and garlic fries!! !